Ramanuj Gupta Memorial prize money Super Division football tournament got under way in Silchar’s District Sports Association ground on Wednesday evening. Played amongst top seven elite teams out of a pool of eight as PWD has abstained from fielding any team from this year round, would culminate with the final to be played on October 1 this year. 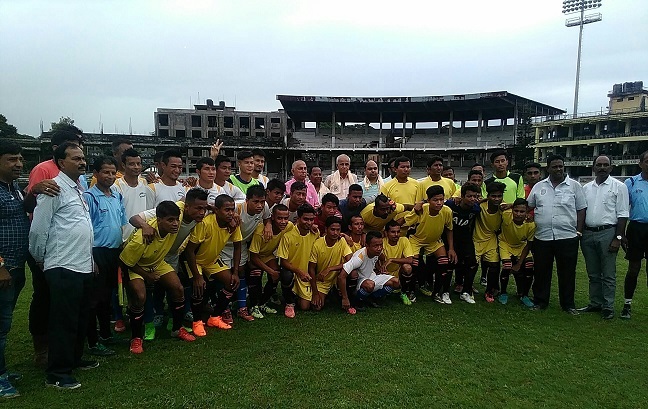 The match was kicked off between Arunachal Sanskritik Sangstha, the champion of the super division held last year and current year’s first division champion Itkhola Sporting Club. The champion team would walk away with prize money of Rs 20,000 and a trophy while the runners up would get Rs 10,000 and a trophy in their kitty. The special change made this year is that in every match the teams would get a match fee which is a first for football tourneys in Silchar. The winning team in each match would get Rs 2500 and the losers Rs 1000, while, a draw would fetch each team, Rs 1500 each.